I love this sweet and delicious Lola that my sindhi neighbor prepares. Since I love her lola and koki, everytime I visit my hometown, she would send these delicious lolas and kokis to my house. When I asked her the recipe for lola, she told me the ingredients that are mixed in the flour. When Srivalli announced the roti mela, the first thing that came to my mind is this sweet lola. I am happy that my lolas turned out to be atleast 95% closer to the ones she prepares. Here is the recipe. Mix the sugar in milk. Add the sweet milk and butter to the flour and knead it to a stiff dough. Take some quantity of dough and roll it to a thick layer. 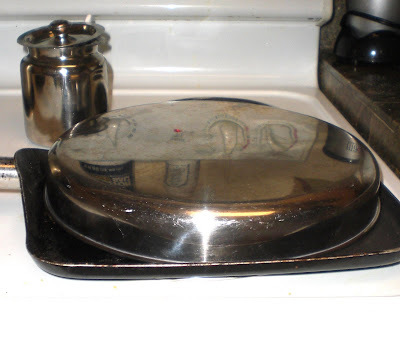 Heat a tawa and when it is hot, reduce the heat to 'between low and medium'. Apply a teaspoon of ghee on the hot tawa and place the rolled out thick layered lola. Apply some ghee on the top and close it with a plate. Let it cook at low heat. Since it is thick, it will take atleast 3 minutes to cook on one side. Flip the other side and cook it closed for another 2 to 3 minutes. Serve immediately. Children will love these lolas as it is sweet. Garnish with sugar. Makes a wonderful snack on weekends and evenings. When lolas come to room temperature, it tends to harden. Break it into pieces and enjoy the sweet crunchy lolas. Microwave it for few seconds if you want it soft. This is my entry to the Roti mela hosted by Srivalli. Thank you Srivalli, for hosting this grand event. 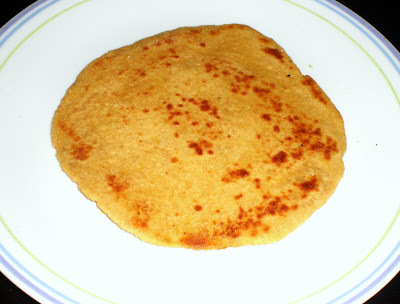 This is also my entry to the Sweet series - Puran poli and sweet roti/chapathi event hosted by me. sweet roti-a, never heard of this before, good one. Have added you to my bay area food blog roll. Great meeting you on Saturday. sindhi Lola lovely name. looks tempting.